Lee Westwood Trophy winner Nick Poppleton with Masters champion Danny Willett (Picture: Driving Golf PR & Marketing). WATH'S Nick Poppleton made quick amends for his Yorkshire amateur championship disappointment as he lifted the prestigious Lee Westwood Trophy with victory at Rotherham. And he did it by turning the tables on Howley Hall's Ben Hutchinson, who had triumphed from two shots behind in the final round to leave Wath second at Moortown. This time it was Hutchinson (66 72 68 69) who had to cede victory to his county team-mate (69 63 70 69), finishing four shots back of Poppleton at Rotherham where Masters champion Danny Willett was back from playing in the Olympics in Rio to support his home club’s premier event. Hutchinson may have been ruing his bogey at the last hole, where he missed a short putt after recovering well from a tee shot into the right rough, but it did not matter. Poppleton, who recorded the lowest round of the tournament of seven-under-par 63 on the second day, played steadily to maintain his lead over the final 36 holes. He showed commendable composure coming down the stretch with a par on the tricky 15th, a birdie at the next, before lipping out on the 17th for a straight-forward par before dropping a shot on the last when the tournament victory was already assured. Poppleton said: “I played really steadily all week, hitting the ball well and the putter came good on the second round. “It was then a question of trying to keep calm and getting over the line and not getting ahead of myself. Sharing second place with Hutchinson on 275 was Braintree's Todd Clements (71 65 69 70). The Lee Westwood Trophy is one of England’s top amateur events. 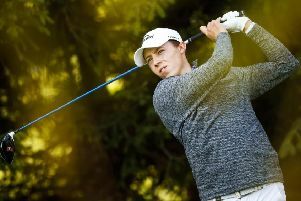 Staged for the 12 th year, it attracted a full field of 141 players from around the UK and abroad including Keegan De Lange who made history last year when he became the first South African junior to reach the final of the British Boys’ Amateur Championship.